I would absolutely love a Zakaz Tankist... May I ask where/who you bought it from? It looks impeccable! Kev1984 and lucky watch like this. Last edited by rocketman 333; March 10th, 2014 at 17:46.
soulbazz and Kisifer like this. This just came in :) gift from a friend. Ejekutor, Kev1984 and Kisifer like this. 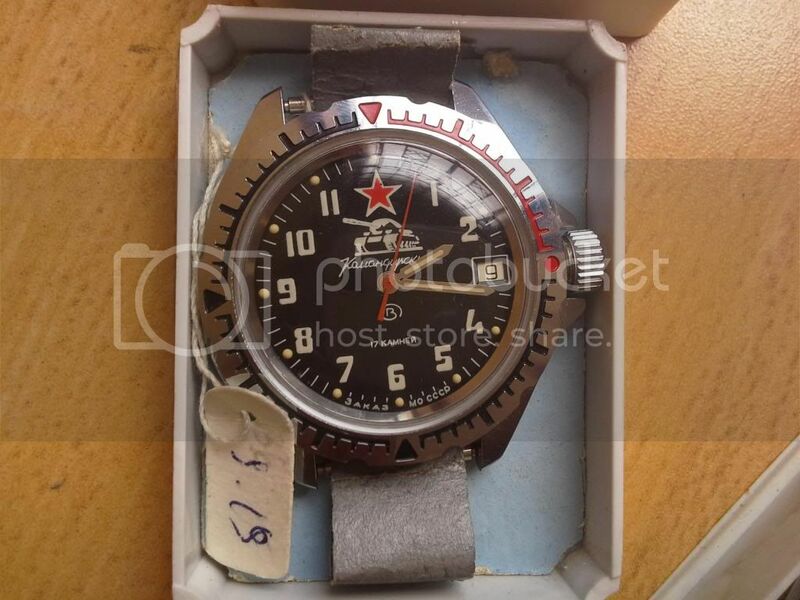 I bought it in the bay a few months ago from an Austrian seller, he get it in Russia in 1989 (through a military relative) and since then, the watch kept in his box, for almost 24 years. That is humbling. Makes you wonder what it has been through, though not much I imagine - given the amazing quality. Great choice. This particular dial is probably the best of all dirskies. It was my first one too. I dont have very bigh wrists, and could not remove any of the links (also no clue if it was possible/and how to do it) there are 7 positions on the buckle even then it was to big. Therefore I decided to change it to a nato strap, also found a normal metal strap. And would like the opinion of the people here which they think would suit better. This is my KGB model I just switched to this one piece leather strap from the Ukraine today. I think they really suit the Komandirskie model and at £6.18 for two delivered you will have a smile on your face. Wauw that is very cheap indeed and looks great!